Make sure you don’t jump past this question too quickly. It is important! Actually this question helps you take responsibility and begin the change process. If you are serious about saving the marriage and want to learn exactly what you can say and do to switch the momentum of the affair and marriage, you must begin with this question. This question gets at the truth. And, only the ferreting out of the truth will put you on the road to breaking free from the affair, and perhaps saving your marriage – if that is what you REALLY want. So, take some time. Think hard. Be brutally honest. This is your first step toward breaking free and getting the life and relationship you really want. Here are just a few of the questions I pose for the “offended” partner for Affair #1: My Marriage Made Me Do it. 1. Do you really want to save the marriage or do you want the feelings of embarrassment and humiliation to end? You thought this would never happen to you. It might be difficult to face family, friends, or coworkers. Do you mull over what you could have said or done to prevent the affair? Do you think of yourself as a failure and are eager to reclaim your confidence and self-esteem? Breaking free from the affair and moving toward saving the marriage will mean you will need to develop the freedom to assume different roles and to act differently in the relationship. Do you really want to do that? Are you willing to expand who you are? 4. 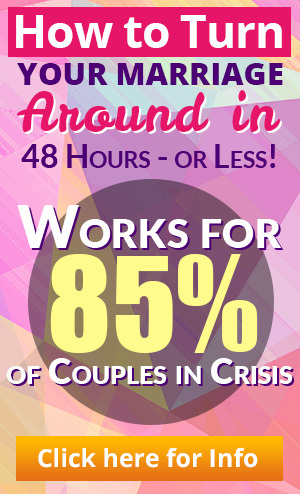 Do you really want to save the marriage or do you want vindication against the other person? Do you feel like you have lost out to this other person? You came in second? Does that bother the heck out of you and having the “marriage back” would mean that you stick it in the face of the other person? Is competition stirring your juices? 5. Do you really want the marriage back or do you primarily want to end the pain? The pain of abandonment and being alone can be exceedingly intense. Do you think you can handle it? Endure? Actually learn from it? Or, are you intent upon the affair ending and getting the marriage back to eradicate your pain? 6. Do you really want the marriage back even though you might not like your spouse very much and perhaps you doubted the wisdom of getting married in the first place? There are innumerable reasons why we marry. Some conscious. Most of them unconscious. Couples who possess rock solid certainty that their marriage was meant to be and had few if any doubts on the wedding day are a rarity. Give this question some serious thought. Perhaps the affair is a symptom, sign or indication that the marriage was in serious trouble from the get-go. Perhaps not only your spouse, but you have reflected on the validity of the marriage or a secret desire to be somewhere else. 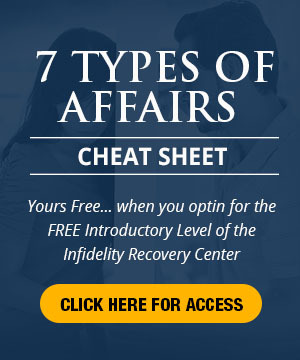 I provide more questions to ponder for this kind of affair and more questions related to “Do I REALLY want to save the marriage?” for the other 6 affairs in Break Free From the Affair.